From Asmus Toys. 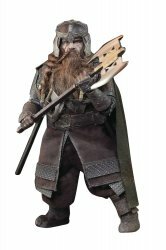 The Gimli Sixth Scaled Figure features more than 32 points of articulation and an authentic and detailed fully realistic likeness of Gimli from The Lord of the Ring film trilogy! Standing about 7 3/4 inches tall, Gimli features 3 sets of alternate hands, detailed and tailored movie-accurate cloth clothing, and accessories, plus weapons such as his throwing axe, long single sided axe, double-sided two-handed axe, and a single-sided two-hand long axe! Gimli comes with an Asmus Toys figure stand for easy display. Add this stunning figure to your collection today!